Fiesta Ball is a week from Wednesday. The girls have been emailing deciding what we are going to wear. The theme is Red, White and Krewes and we a celebrating the 100th Anniversary of Naval Aviation. It all started when Paulette found a novelty store website. She found an adorable red, white and blue vest. As it turned out the thing is plastic. We all wanted the light up white boas and the blinky plastic red, white and blue tiara. We nixed the plastic vest. It's a formal ball. You can go in costume or formal attire. So, I wanted to dress up a bit. So, here is what I will be wearing to the ball: floor length blue skirt, white blouse, and red vest. I will wear the white lighted boa; the red, white, blue binky plastic tiara; and a red tinsel wig. I chose the blue skirt, white blouse, and red vest because I have a picture of it in my mind. George is wearing white pants, red tux shirt, blue tux vest and bow tie. I'm getting him a hat that's plastic but looks like an old timey straw hat with a red, white and blue band around the hat. I'm also making him a red, white and blue belt with a rhinestone flag buckle. My attire will sort of match George. Reminds me of the old movie Pollyanna with Haley Mills. In fact, those costumes were from that same period that Naval Aviation began. Now that I have this beautiful picture in my mind, I have to pull it together. The boa, tiara, wig, and George's hat and his outfit has been ordered. I have the white blouse. I will make the blue skirt and red vest. Out of all of my patterns I do not have an A-lined skirt pattern. I have chosen a pattern for an A-line dress and I'll adjust it to become a skirt. I have chosen a vest pattern but the pattern is a size too small for me. So, I will adjust the pattern to fit. Tomorrow I need to shop for fabric. Hopefully, I'll take pictures on the creation of this outfit. Should be interesting. I've been making luggage grips lately. They really are fun to make. They are made completely in the hoop. So far, I've made some with the word "MINE" and "CAJUN" outlined and filled with rhinestones. I can make them with any word or name. I've listed them in the Etsy Shop and sure hope they sell. Don’t forget to visit our catalog at www.companycasuals.com/cajunstitchery and www.cajunstitchery.etsy.com often. We are also on Twitter and Facebook. It’s Memorial Day Weekend. Get out all of your red, white and blue. While you are enjoying the weekend at the beach, or having a barbeque or meal with friends, please take some time to remember those who have stood/are standing on a wall protecting us and providing the wonderful freedom that we all too often take for granted. God bless every one of them. If you see someone in the military, please say Thank You. I’m reminded of a story about my step-father, Johnny. My dad died when I was 10 months old. When I was 3 years old, my mother re-married. For all intents and purposes, Johnny was my daddy. He was the only daddy that I knew. And he was a wonderful man. When Kim and I went to Louisiana last week and visited our cousin Roland, Roland gave me a picture of Johnny when he was in the Army. Johnny was in Korea in the early 1950’s. There is an old movie called Pork Chop Hill about one of the bloodiest battles in the Korean War. Johnny used to tell me that he was in that battle. He said it was very cold and he wore every piece of clothing that he owned, layered, one over the other. He and his fellow soldiers walked up Pork Chop Hill. The battle raged on and soldiers were dropping like flies. They were hunkered in trenches. His friend to his left was shot and slumped over. His friend to his right was shot. Finally, a bullet hit Johnny. There was so much blood and death around him that he believed he was dead. The medics came and took the bodies of his two dead friends and put Johnny on a stretcher and hauled him down the hill to the medical tent. The doctor was peeling off his clothing where the bullet entered. Layer after layer was peeled off. About half way through his clothing the bullet fell out. He hadn’t even been scratched. This week has been a week of can wraps. Some time ago, I made a can wrap with the Cajun Stitchery logo embroidered on it. I was talking to my friend, Charlotte, who drinks bottled beer. She said that I need to create a wrap that fits both cans and bottles. It needed to be something adjustable. Since that time, I’ve tried several designs but nothing that really pleased me, until this week. While making the can wraps for the Proud to be a Union Thug orders, I kept pondering how to do this all ITH (in-the-hoop). There are several steps to the can wrap, cutting the fabric and stabilizer, embroidering, sewing the long side, turning, pulling the stabilizer through, sewing the ends and trimming. I digitized a rectangle the size of the can wrap. Then I digitized 4 eyelets, 2 on each end. The rectangle was digitized like I would for a patch. After embroidering the can wrap, I punched holes through the eyelets and used some very small elastic to run through the holes. After trying various combinations of threading the elastic, I happened upon the one that worked. Yep, it’s adjustable and fits both cans and bottles. Are there fewer steps? I hoop the plastic (yes, they are waterproof) and stitch out the first outline. Then I glue the stabilizer onto the plastic. Then I glue the fabric onto the stabilizer and the back side of the plastic. Back in the machine and stitch out the second outline. Once again I take the hoop off the machine and trim fabric and stabilizer on both sides and put the hoop back in the machine. At this point, I embroider the design, and then I finish the satin stitched outline of the patch. The thread ends and jump stitches are trimmed. The eyelet holes are punched and the elastic is threaded and knotted. Finis. I haven’t timed it yet to see if this goes any faster. With the new ITH can wraps, I took some camouflage fabric and made some manly can wraps. One of the wraps has a pistol embroidered on it, another has a man shooting a rifle, and one has the silhouette of an elk. These have been listed for sale in the Etsy Shop. They would make great Father’s Day presents for any gun collector, hunter or sportsman. I also listed a couple of Proud to be a Union Thug can wraps. Speaking of Proud to be a Union Thug, my friend, Sandy, says that she believes I am the first to do the slogan in embroidery. There are some sites with the slogan in screen printing but I’m the only one with embroidery and I think the only one with the slogan on can wraps. Google it and see. If you know any union members, please direct them to me or to our Etsy Store. I sure would appreciate it. Speaking of referrals, if you refer a customer to Cajun Stitchery and they hire us, you will get a 10% discount on your next embroidery order. Just make sure you remind me. This past Wednesday I was able to join my Wednesday night girls. I’ve missed Wednesday nights for 2 or 3 weeks. It was good getting back in the groove with my girls. 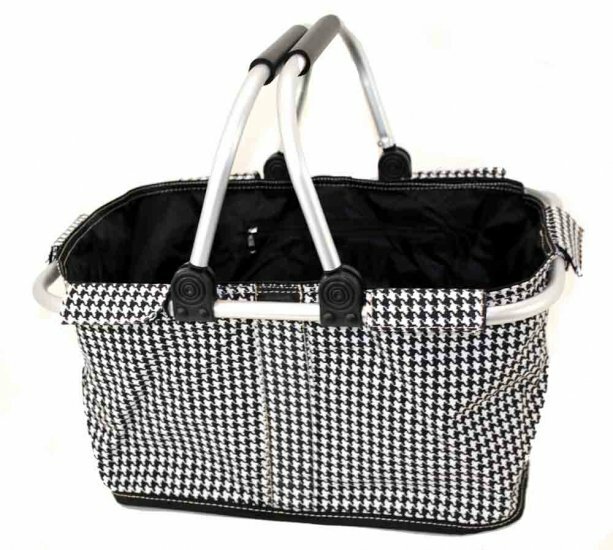 Since I was bringing some items for various girls, I brought my new collapsible, hounds tooth market basket to carry the items. Some of the girls were looking at the market basket and we were talking about Sharon and her zebra print purchases. The vendor that I used for my basket and Sharon’s items does not carry the market baskets in solid colors. All of their market baskets are prints. However, I have another vendor that carries the solid colors, as well as some prints. These baskets are canvas and do not have the zipper pocket on the inside. While browsing through this vendor’s online shop, I found they have a whole bunch of zebra print items that the other store did not. In addition to the regular market basket, they have a mini market basket that is the next size down from the regular size and they also carry a selection of vinyl market baskets. They do carry the market baskets in purple. 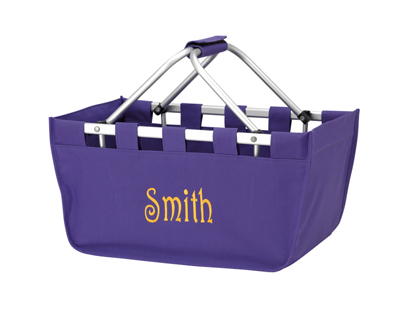 I was thinking how cool that would be to put krewe logos on purple market baskets. If I order from this company, I may just get myself a purple market basket for the Mardi Gras season. Ooooo, I could get one for each season; red, white and blue for patriotic picnics; red and green to carrying Christmas gifts and food items; orange and black for Halloween candy; and pastel colors for Easter baskets. If I’ve learned nothing else from my Nereids, I have learned that my attire must match. We could have baskets in every color to match our outfits. These baskets would also be great for business logos, which is exactly what I’m going to put on my market basket. George is busy doing electrical work in the house next door. It is slow going when you are the only one remodeling an entire house but he is doing a fabulous job. I’m so proud of him. Our sago palm had babies last fall and George potted them. We planted all that we wanted in our yard and had 8 or 9 left over. Last week I posted on Facebook that I was giving them away to anyone who wants to come and get them. There were a few people interested but when they learned that I live in Warrington, they never showed up. I just hate to throw them away. People pay good money for sago palms in Florida. My friend, Paulette, wants all of them. So, I will bring the sago palms to Paulette next Wednesday night. I’m so glad they are going to have a home. The garden is beautiful this year. The carrots are ready to harvest. The tomatoes and peppers have flowers. We are harvesting garlic and onions everyday. I love to garden. This week’s sale is an adjustable can wrap with your name or initials embroidered for only $5.00. The judge had just awarded a divorce to Boudreaux’s wife, Marie, who had charged non-support. He said to Boudreaux, "I have decided to give your wife $400 a month for support." "Well, dat's fine, Judge," said Boudreaux. "And once in a while I'll try to chip in a few bucks, myself." Here we have le déjeuner in the morning. (Traditionally in rural families, there was nothing petit about it. Folks needed sustenance after doing their early morning chores. The big meal of the day, le dîner, was taken at noon. This was because it was too hot to cook in the afternoon, and also because most farm families provided a noon meal for their hired hands.) In the evening, we still eat our souper. French Canadians use the same terms we do. I still can't get over how popular the Union Thug can wraps are. We mailed the first order out today. The customer is a postal worker and had us make a Union Thug patch with a red, white and blue mailbox. The patch is going to be a gift. Of course, Cajun Stitchery includes a lagniappe with each order. This customer is going to be surprised and delighted to see her lagniappe. I had to stitchout a sample of the patch design on fabric, so I turned it into a can wrap. Turned out cute, don't you think? I finished an order for an even dozen of the can wraps this morning and as soon as I get the address, that order will be mailed. The customer is a very dear friend of our's and I'm trying to decide on "the perfect" lagniappe for his order. Sometime ago, when I was originally making can wraps, a friend of mine told me that she didn't like them because they weren't adjustable. She drinks bottled beer. The can wraps fit a regular soda or beer can. Today I took a little time out to design an adjustable can wrap. George loves it. They are all done in-the-hoop. I put eyelits in the design so that a string or shoelace or whatever can be threaded to keep the wrap snug at the size required. I did one with elastic but the can slips out of the wrap easily. We had other ideas but those were way too much work and we'd have to charge more than anyone would pay. My next step with the can wraps is to do the new version with the Proud to be a Union Thug design and see if this speeds up the process any. Wow! What a week this has been. Kim arrived Sunday afternoon, as planned. We all but scratched the Louisiana trip, except that I did need to drive Kim to the Baton Rouge airport to catch her flight on Friday. The news kept talking about the horrible flood but everyone we spoke to said there is no flood. Of course, those people were not in harm’s way. Our problem wasn’t whether there was flooding in Lafayette, but rather, whether we could get from Pensacola to Lafayette without running into the flood in the middle. Thank goodness for my friend, Matt Drees. Matt (who is in the military) told me via Facebook that he was stationed in Lafayette to help the National Guard out with the flood. Early in the week Matt said that they were going to open the Morganza Spillway and that wouldn’t rise to the point of flooding until Wednesday. My thought processes were: fine, I could get to Lafayette, but could I get back on or after Wednesday? So, the trip remained cancelled. There were no road problems or flooding between Pensacola and Baton Rouge, so the plan was that I would drive Kim to Baton Rouge on Thursday and we would stay in a hotel. I would deliver her to the airport on Friday and then drive home. When Wednesday arrived, Matt said that the waters were not rising to the level expected and all he was doing was going via boat to the various camps to stop the looting. Why do people loot during devastations? Hmmm. So, it was clear sailing to Lafayette. There was no time to board the dogs, so it was just easier not to tell George that we might be going to Lafayette after all. We loaded the car and left Florida around noon on Thursday. The trip was very smooth until we reached Baton Rouge for the 5:00 traffic. After enduring about an hour of first and sometimes second gear, we finally were across the Mississippi River. The traffic eased up and it was smooth sailing to Lafayette. It was probably around 7 or 8 p.m. when we finally got to my Cousin Roland’s home. Roland’s wife, Ruby, fed me crawfish etouffe – yes, 2 helpings of the stuff. I was a happy camper. We stayed and chit chatted and they got to meet Kim and vice versa. Their house was full because their grandson, Anthony, was graduating from high school the following day. About 10 p.m. we bid our farewells and found a room at the local La Quinta. The following day we were up and checked out around 10 or 11 a.m. I had to have Kim at the airport in Baton Rouge by 3 p.m. We wanted to go to St. Martinsville to see if the flood had damaged La Maison DuChamp. It had not. Kim has been trying to photograph portraits that usually hang in the house of our great, great grandparents. The last time she was there, the portraits weren’t because they were being cleaned. She finally was able to get the photographs that she wanted. I got to see the house and we walked around the town for a little bit. We didn’t have a whole lot of time but La Maison DuChamp is her work and that is important. We didn’t even have time to visit my Uncle Donald, Aunt Philo or Uncle R.L. We blew in and blew out. Once back in Baton Rouge, Kim directed me to the airport. I drove and drove and drove but we finally reached the airport and she was there by 3 p.m. Then I had to get to I-12 to come home. I began backtracking I-110 to Oh My Gosh there was that bumper-to-bumper traffic and I was in the far left lane. I saw the I-10 sign up ahead but nothing about I-12. Then I notice there is an exit to the left for Government Street. So, I took it. I then proceeded to drive and drive and drive and became completely and utterly lost. Asking for directions is not beyond me, so I stopped at a little sandwich shop and asked how to get to I-12. I was only around the corner from it. I got on I-12 and proceeded home. There was much more traffic on Friday than there was on Thursday. Several spots along the way were under construction and the traffic slowed to a crawl. All in all, the trip back was uneventful and smooth until I reached Mobile. Apparently there had been a wreck in or near the tunnel and traffic was backed up almost to I-65. We inched and inched our way. This traffic jam lasted at least an hour, if not more. Finally, I reached the bay bridge and came on home to Pensacola. I arrived home around 7 p.m. It’s good to be home. Next trip we’ll board the dogs, take George, and visit more relatives. As a little side note, when Kim and I were leaving Lafayette, we stopped to fill up the tank with gas. While we were getting gas we noticed the newspaper front page headline: “FLOOD”. We just laughed. The rest of week had been interesting, too. I had to work and decided to deliver some orders so that Kim could see some of Pensacola rather than staying in my house the whole time. All of the zebra print items came in. Sharon wanted her name embroidered on some, and others could not be embroidered. Since Kim travels so much, she suggested what we named “luggage grips.” You know those things that you put around the handles of your luggage that have Velcro to secure. Anyway, those turned out to be really nice and easy to make. Sharon got a couple and I made about 5 of them for Kim’s luggage. We packed the car with all of the zebra print items and drove to Navarre to deliver to Sharon. Sharon was so funny. She was truly excited to get all of this stuff. While we were there Sharon was still buying more stuff that I had in zebra print. We left Studio 98 and went to a restaurant on Navarre Beach that used to be Cocodre but is now Monkey something. We had a nice lunch and drove back via the beach road. Kim got to see our beautiful sand and surf. That day was beautiful and the water was all shades of emerald greens and teals. The next day I took Kim to Native Café on Pensacola Beach. We ran into my friend Becky who sat with us and chatted for a bit. Then we went to Geronimo’s Gift Shop to look around. They had some fabulous stuff. We giggled because they had some of the zebra stuff that I was selling – without embroidery and at a higher price. We drove around the beach. Kim loved the spaceship house and had to take pictures. At night, while Kim was doing her genealogy work, I was working on embroidery. Like I said, I made her 5 of the luggage grips and embroidered 4 dainty handkerchiefs for her. I’ve been working on the Proud to be a Union Thug can wraps and a variety of other items. Memorial Day is coming up at the end of May and I’ve listed several patriotic items in our Etsy store. For this week only – through next Thursday – I will embroider “USA” in red, white, and/or blue on luggage grips for $5.00 each. This is really a good sale because our minimum order is $9.45. Boudreaux and Fontenot were on their very first train ride. They had brought along bananas for lunch. Just as they began to peel them, the train entered a long, dark tunnel. "Have you eaten your banana yet,"
Boudreaux asked excitedly? "No," replied Fontenot. "Well, don't touch it den," Boudreaux exclaimed. "I just took one bite and went blind!" Essence is perfume in Louisiana. We put de la gasoline in our chars (m.). Les voitures are what horses used to pull in le bon vieux temps. My cousin is visiting from California. We were going to Louisiana to visit relatives but there's a flood in our way. Truth is that we probably could still go and return and be safe, but you never know. I cannot risk getting to southwest Louisiana and finding I cannot get back for a few days. We are going to Baton Rouge on Thursday, though. That will be a fun trip, I'm sure. In the meantime, all of the zebra print items arrived and have been embroidered and today we personally delivered the items to our customer. She was tickled pink. She owns a hair salon and all of the girls at the salon were google eyed at all of the zebra print items. I made them smile and they made me smile. It was a delightful time. 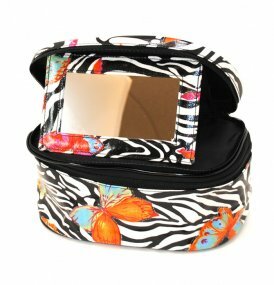 They are getting ready to go to a hair show and just know they will be the talk of the show with the zebra print bags. A big thanks goes to my cousin Kim for coming up with the idea of luggage grips. You know, those things that go around the handle of your luggage and secure with Velcro. Some of the zebra print items could not be embroidered and some the customer didn't want embroidered; so, we made a couple of luggage grips. They are as good as the luggage tags but much more functional. Again, thanks to cousin Kim because embroidery, even in hot pink, really doesn't show up well on zebra, or any other kind of, print. It's just too busy. Kim suggested doing applique with a black or white background and the embroidery on the applique piece. Sheer genius! It matches and is readable. Luggage grips are going to definitely become a part of our growing list of items that we sell. In fact, the luggage grips can be done completely in-the-hoop, except for the Velcro. Easy as pie. Since I purchased 4 bolts of Velcro awhile back, then wondered "what in the world am I going to do with all of this?" I now have a use for the Velcro. Woohoo! Kim suggested that I do some with the word "MINE" on the grip. I like it. Yep, we can make the luggage grips for $7 each. Email if you want to purchase one or more. This past weekend I was working on can wraps for a postal friend. Ooooh, there is an issue going on in Wisconsin. Apparently the Wisconsin government has passed a law that government workers cannot have unions or something to that effect -- do not quote me on this. Nevertheless, my friend asked me to make can wraps that say "Proud to be a Union Thug." At first, I was a bit concerned about doing embroidery to celebrate thugness. After I looked into it, it appears that Sarah Palin must have used the word "thug" in a speech and it caught on. I noticed on the internet that there are places selling promotional type items with the "Proud to be a Union Thug" screen printed. Anyway, the can wraps turned out adorable in red, white and blue. Another design was created using one of our stock designs of a mailbox and the "Union Thug" embroidered across the pole. Don’t forget to visit our blog at www.cajunstitchery.blogspot.com, catalog at www.companycasuals.com/cajunstitchery and www.cajunstitchery.etsy.com often. We have a lot to cover today, so let’s get started. First topic is a trip to Louisiana. A few months back when my cousin Kim came to visit, I kept telling her that aside from looking at all of the Theaux’s for her genealogy, she should also meet and look into the Landry’s. Mama and my Aunt Lil have told me such wonderful stories about being little girls with my great grandmother, who was always referred to as “Mom.” My great grandfather was Henry Landry. Mom’s maiden name was Felecie Romero. Both sides of the family have a rich history, but the Landry’s are, by far, the party animal side of the family. The Landry’s are the Cajun side of the family. Nevertheless, I told Kim that I need to introduce her to some of the Landry’s. She said that she had a conference coming up in May in one of the Carolina’s and we planned that after her conference, she would fly to Pensacola where we would drive to Lafayette. Sounds like a good time and a good plan. I cannot take off very much time because when I’m gone Cajun Stitchery is closed and Cajun Stitchery cannot afford to be closed. So, I planned one day to drive to Lafayette, one day to visit, one day to return. I contacted my cousin Eddie to help gather some Landry’s for Kim to meet. Eddie replied that he would be glad to help and May was a good month for that. Besides, we wanted to visit with my Aunt Philo who is now 92 years old. Kim left California for the Carolina’s early this week. I began making some solid plans. First, I contacted Aunt Philo’s friend, Paulette, to see if she would be in town for our visit. It turned out that Paulette is going to be in Daytona Beach the entire week. That’s okay. I will still visit my aunt. Since Philo is deaf, I don’t want to visit if we aren’t going to understand each other. If she can see, she was always able to read my lips and Kim says she is fluent in sign language. So, we are still okay with that. Neither Kim nor I could get in touch with Eddie since that first message. That’s okay because I can get in touch with my cousin Roland. I called Roland and found out that one of his sons was recently killed in an auto accident in Naples, Florida. Roland said the son was cremated and they had a nice memorial service in Naples and last weekend they had another memorial service in Louisiana. The whole family attended. I was heartbroken. I am so keenly aware of the unfathomable heartache of losing a child, no matter how old he is. Roland, a true Landry, nevertheless wanted us to come. He said to let him know what day we would be there as soon as I knew, so they could gather some local Landry’s to meet Kim. George had been vacillating about going. He really wants to go. If he goes, then we need to board the dogs with the vet. I called the vet and got the information that I needed. They will board the dogs; give them their shots and annual check up, all at the same time. But they need to know in advance when we will be leaving the dogs. We have to make reservations for the pups which I did not because I wasn’t sure what days we would be going to Louisiana. I then contacted my friend, Sandy, to let her know that we were coming. Sandy and I have never met face-to-face. She was a good friend of Mama’s and has become a good friend of mine via email and the internet. I would love to meet Sandy face-to-face. Sandy replied that she would love to meet me, as well. She will be in town. One problem, though, Louisiana is having a flood and next week is forecast to be the worse of it because the Army Corp of Engineers is probably going to open the Morganza Spillway which will flood New Iberia and the surrounding areas. They may have to evacuate. She suggested that I watch the flood news and sent me a map of the flood area in the Atchafalaya Basin. At this point, George and I started realizing that if Memphis is flooded from the Mississippi and they are dealing with mass devastation, and the river has begun flooding the State of Mississippi, and we have to cross the Pearl River in Mississippi and the Mississippi River in Baton Rouge, not to mention the Atchafalaya, it may not be a matter of whether or not our destination gets flooded. It may be that we cannot get there through the flood on I-10. I began searching the internet for any news. The Bonnet Carre Spillway has already been opened to divert the water from New Orleans. The Advertiser in Lafayette is prominently reporting what to do if you are told to evacuate. The flood is headline news all over the area. The Louisiana governor said the Morganza Spillway will be opened and to expect 5-25 feet of flooding throughout the Basin, including New Iberia and St. Martinsville. Lafayette probably will not get flooded. The last thing that anyone needs during an impending or potential environmental devastation is company from out-of-state. So, I tried contacting Kim. Kim will arrive in Pensacola late Sunday afternoon. Bless her heart, she’s in the middle of a conference and I’m emailing that we may not be able to go to Louisiana. She replied that we will discuss this when she gets here and see the situation at that time. I love a cool head. Of course, in order to make reservations to board the dogs, we have to give at least a little leeway. Besides, if she has work to do in Louisiana, she may want to fly directly to Lafayette, rather than Pensacola. No. She says her work is in Baton Rouge. The last I read was that Baton Rouge has already begun flooding. Then I called Roland to let him know the situation. Like a true Landry, he says, “it’s not going to flood here.” Then he begins to explain the levy system that was constructed after the 1927 flood. Hmmm. He said that the government isn’t going to close I-10 and I should be able to get there. Hmmm. Roland lives in Youngsville, between Lafayette and New Iberia. As it stands today, I don’t know. Common sense tells me not to take chances and intentionally travel an area that I know is already having problems. George doesn’t want me to go, especially since my trip back to Pensacola would be me alone, if he doesn’t go. On the other hand, my heart wants to go play with the family in Louisiana. Who knows what will happen between now and Sunday? As a sideline from calling the veterinarian, it dawned on me after talking with Leigh Ann that I should make the dogs coats with the Cajun Stitchery logo embroidered on the side. I love animals and I know that dogs are built to work. Some dogs are hunters; some are workers, some herd, etc. Evie has always had chores. She cleans the floor and frequently is a pre-washer for the dishes. Stinky doesn’t have chores – she’s a princess. I decided that their new jobs will entail advertising for Cajun Stitchery. You know what they say; the two biggest attention getters are babies and animals. So, I made Evie a coat with the Cajun Stitchery logo on either side. I haven’t made one for Stinky yet. They need to wear their coats to the vet’s. Maybe we’ll pick up some business there. Over the past year or two, some of the girls have been giving collapsible market baskets for gifts. 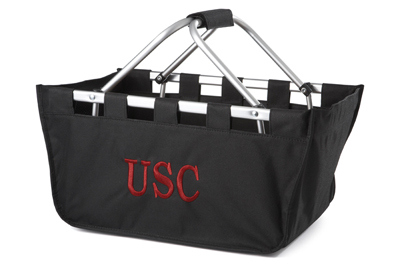 The market baskets are cloth with a collapsible aluminum frame. They get the girl’s name or initials embroidered on the side of the market baskets. They get these baskets from a really cool store in Gulf Breeze. Well, that’s not right. They should get them from Cajun Stitchery. That is, if Cajun Stitchery could offer them. We can now. Browsing around on the internet for wholesalers, I found the baskets and oh so much more. I did find a place that carries the baskets that the girls have been giving. But I found another place that carries the baskets, but better. I can get either. The girls told me they pay about $30 for the baskets that they have been giving. I can do that, too. I found a really cool wholesaler in Georgia that sells the baskets in zebra, leopard and a multitude of other prints. These baskets are lined with a zippered inside pocket, and I can embroider on them. The cool thing is that I can sell them for $30, too, including the embroidered name/initials. 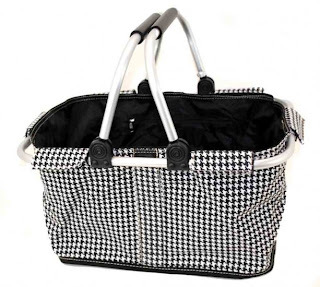 This wholesaler also carries the insulated market basket with zippered top to keep your items cool. I can sell the insulated market basket for $35. They have bunches of other cool stuff. I have already placed an order with them for a variety of items. 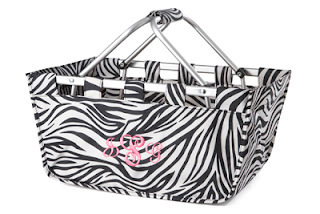 One of my girls has already ordered the 3 piece rolling luggage with telescopic handles ($200), rolling insulated cooler with telescopic handle ($40), insulated market basket ($35), and lined market basket ($30), all in zebra print. The pictures and descriptions appear to be a high quality. Something else they have that really caught my eye was an entire line of fleur de lis items. Believe it or not, as I was typing the above, the first shipment from my zebra wholesaler came in. The luggage will be coming in a separate shipment next week. The rolling cooler in zebra print with hot pink trim, came with black trim and the wholesaler is sending the correct one. 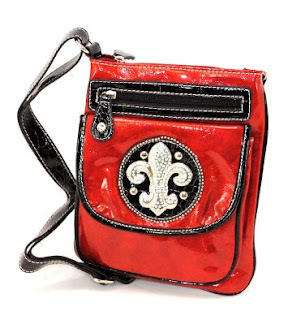 A fleur de lis wallet that I ordered was out of stock and not included but this stuff is beautiful. I cannot embroider on all of it. For instance, the insulation on the insulated market basket with zippered top would be compromised if I embroidered on it. 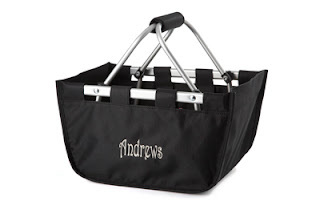 But I can embroider on the lined market basket and the rolling cooler with telescopic handle. I even got myself a treat. I bought a hounds tooth lined market basket that I will be embroidering our logo upon. 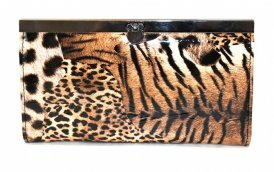 There are some really cool wallets and purses. I’m including the professional pictures of most of these items but honestly, some of these pictures don’t do the product justice. It’s mostly laminated fabric. It shines! Email me if you want to place an order or have any questions. Memorial Day is coming up at the end of May and I’ve listed several patriotic items in our Etsy store. For this week only – through next Thursday – I will embroider “USA” in red, white, and/or blue on your jeans or a shirt or other embroiderable item for $5.00. This is really a good sale because our minimum order is $9.45. Thibodeaux called the airlines information desk and inquired, "How long does it take to fly from Baton Rouge to New Orleans?" "Just a minute," said the busy clerk. "Well, said Thibodeaux, "If it has to go dat fast, I tink I'll just take da bus." In Louisiana when we jouer à la pelote, it is typically a game of baseball, football or soccer that we are referring to. Careful, though, because for our French-speaking Canadian neighbors, la pelote refers to female genitalia.